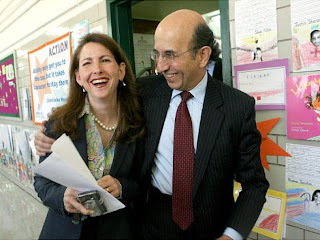 In what's likely to be the new status quo for the reformy crowd, overpaid charter magnate Eva Moskowitz takes surging Bill de Blasio to task for making the "choice" to send his kids to public school. The previous meme was simply trashing people like Diane Ravitch and Matt Damon, who had relatives in private schools. At that time, their absurd and idiotic argument was that such people wanted to deprive poor children the opportunity to goose-step along with Eva and Doug Lemov. You see, in the quest for our tax dollars, it makes no difference that Eva and KIPP are not offering what's at Sidwell Friends or Dalton. Who cares if it's a test-prep factory you wouldn't send your kid to on a bet? The point is that is your choice. And the more crappy schools poor children can choose, the more money for the likes of Eva, Geoff Canada, and Rupert Murdoch, all of whom love your children more than you do. The great thing about this is they can now trash absolutely everyone who opposes charter schools. You chose to send your kids to free public schools and now you oppose us taking the high scorers and leaving what's left for neighborhood schools to fret over? You, sir, are a hypocrite! As am I, of course, for sending my kid to her local public school. What's really galling, if you bother to read her drivel, is that Eva doesn't want her fancy schools to have to take in the high needs kids public schools take without question. She repeatedly insists she's a public school, but let's face it, she makes twice what any public school principal does, spends all kinds of money on advertising, and sued to avoid facing a state audit. What the hell kind of public school is that? Eva Moskowitz wants to pick and choose who gets to patronize her "success" academies, Eva Moskowitz wants to take state money, but she doesn't feel we lowly taxpayers have any right to know what she does with it. Eva can write trash about Bill de Blasio in Rupert Murdoch's yellow rag every day of the year, for all I care. But it's pretty clear to me she isn't worthy to touch the hem of de Blasio's garment. And if I were de Blasio, I'd be glad. Who knows where that hand has been?